Vacationing in the Caribbean Islands? Are you looking for the best of the Caribbean Islands? I almost always pick one of the Caribbean islands when going on vacation. Choosing the perfect destination is always an important decision. There are so many vacation ideas out there, sometimes it hard to settle on just one. One island always has me coming back though, it gets me every time. Tortola is the island that I just can't quit thinking about. From my very first day here, I knew this place had something distinct to offer. Tortola isn't your run-of-mill Caribbean islands vacation. It does have beautiful beaches, crystal-clear blue water, and amazing weather. Those are three of my favorite reasons to go to the Caribbean. I don't know about you but, I need more than just three reasons to choose my vacation destination. So I put together a Top 10 List of Why Tortola is Special to me. 1. It's different than all the others. Part of the charm of Tortola is that it is just big enough, its not too big, not too small. What does that mean? Well it means that you won't find any high-rise resorts, but you won't be bored either, there is plenty to do and see. One added feature of not appealing to the masses is that you can find a beach to have all to yourself. Notice there isn't a soul around! 2. This is the sailing capital of the world. The marina here is home to about 800 yachts at any one time. It also spawned a thriving yacht charter community. One of my favorite things to do is rent a boat and go explore uninhabited Caribbean islands. 3. If boating isn't your cup of tea, then maybe surfing is more your speed. I had always wanted to learn to surf. It was one of those things I put on my bucket list. Tortola is where I made that dream come true. 4. "limin'" might be my favorite Caribbean island pastime. Find out why Limin' is where its at. 5. The Tortola weather will make you forget your day job. With very little variation in temperature, I found out why Tortola is an amazing spot to vacation even in the summer months. 6. The island has accommodations for a wide-range of travelers. You can find a luxury Caribbean villa on the beach, or a lay your head at Brewer's Bay Campground for $40 per night. If you really want to get fancy you can even rent your own private island adjacent to Tortola. Finding an all-inclusive super-resort could be a bit of a problem though. 7. Full Moon Parties are all the rage. If you are looking for a truly wild time then Bomba's Shack is the place to go when the moon is full. Are you on a family vacation? 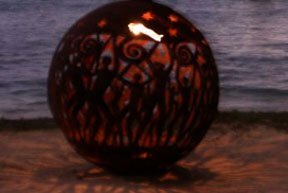 A family oriented Full Moon Party can be had at Trellis Bay. Here you will find why Aragorn's Fireballs are world famous. 8. Take a driving tour of the island. A bit of caution though, this isn't for the faint of heart. Renting a jeep (highly-recommended) and discovering what is off-the-beaten path is one of my favorite activities. 9. Don't forget the beach. I know all Caribbean islands have great beaches. 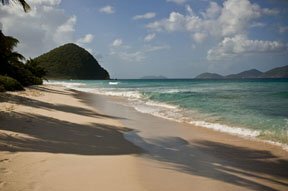 Tortola has eight exquisite beaches for those of you who want to kick back and feel the trade winds blowing through your hair. 10. The people of BVI are amongst the friendliest in the Caribbean. They are happy and helpful people. Unlike many other island countries you can venture out at night without having to worry about the part of the island you're on. Just to let you know there is so much more to see and do here. I kept the list to 10 but really I could go on all day. I didn't even get to the food, which is normally the first thing I think about when I wake up in the morning!